The two Koreas held a symbolic groundbreaking ceremony in Kaesong, North Korea, on Wednesday to link the coutries' railroads across the border and modernize North Korea’s decades-old railway system. A delegation of 100 South Korean government officials, lawmakers and senior citizens separated from their families during the Korean War traveled across the border by train. But analysts in Seoul are skeptic saying this ambitious project would remain more of a “show,” at least for now while negotiation between Pyongyang and Washington to denuclearize North Korea in exchange for economic assistance is at a standstill. “I would say this ceremony is a ‘useful lie,’” Andrei Lankov, a Russian scholar who teaches North Korean studies at Kookmin University, told ABC News. 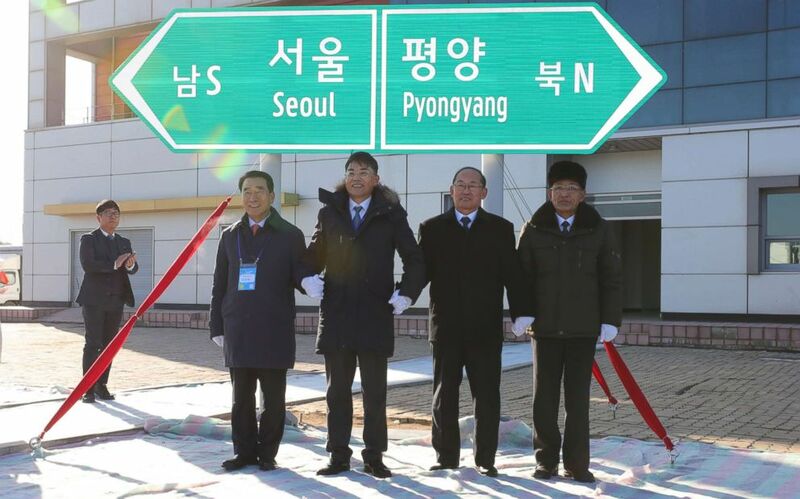 Officials from South and North Korea stand in front of a road sign during the ceremony for a project to modernize and connect roads and railways over the border between the Koreas at Panmun Station, Dec. 26, 2018, in Kaesong, North Korea. South Korean President Moon Jae-in and North Korean leader Kim Jong Un agreed during the first inter-Korean summit in April to work together to link the railways, which would inevitably involve modernizing the North’s railway system. Both Koreas agreed on a groundbreaking ceremony within the year at a September summit in Pyongyang. A joint survey followed to inspect the current conditions in the North and also to draw up what needs to be done. Officials have yet to announce details for the project but many analysts believe it will cost billions of dollars and questions on who will actually pay for it remains a huge roadblock. “Since there is no way North Korea could do this alone, they may have their own expectations on South Korea [paying for the reconstruction of the railroads]. But that does no way mean they are willing to give up their nuclear weapons in exchange,” said Choi Kang, vice president of the Asan Institute of studies in South Korea. Still, Seoul is desperate to keep up the momentum and the ceremony, although symbolic, is the least that could be done to keep Pyongyang in the game. 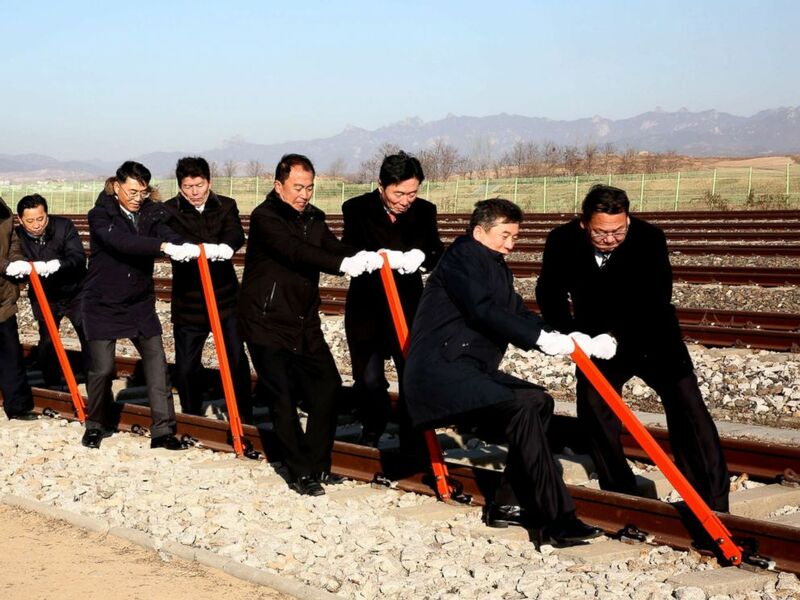 PHOTO:South and North Korea's officials try to connect the railroad during the ceremony for a project to modernize and connect roads and railways over the border between the Koreas at Panmun Station, Dec. 26, 2018, in Kaesong, North Korea. “South Korea is in a different position. Whereas the United States chooses to slap sanctions on North Korea for complete denuclearization, South Korea’s strategy is to gradually push for denuclearization by offering multiple carrots for motivation while keeping good relations with the North,” Park Hyung-joong, head researcher of North Korea policy department at Korea Institute of National Unification, told ABC News. Such differences between Seoul and Washington are gradually narrowing down through a U.S.-ROK working group that started to discuss details last month. The ball remains in the United States’ court while the two Koreas are quietly agitated by the slow pace of the nuclear negotiations. ABC News' Hakyung Kate Lee and Liz Sunwoo Kim contributed to this report.